FIJI: Savusavu Bay's entrance. We hovered, nearly motionless for three hours from 4 -7 am in 200 feet of water with no anchor. We wanted to enter the bay on good light after our overnight sail from Makogai. The steam is due to Savusavu's natural hot springs. Our uncanny ability to arrive at civilization at the outset of a long holiday prevailed upon arrival at Savusavu. 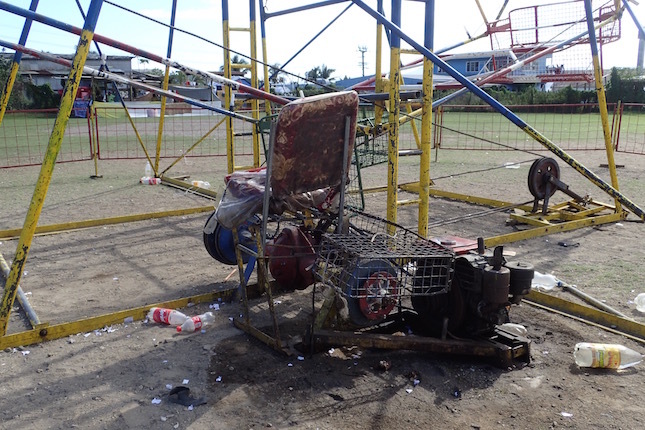 Our sorry produce state would wait, as Fiji’s “Sports Day” just kicked off. 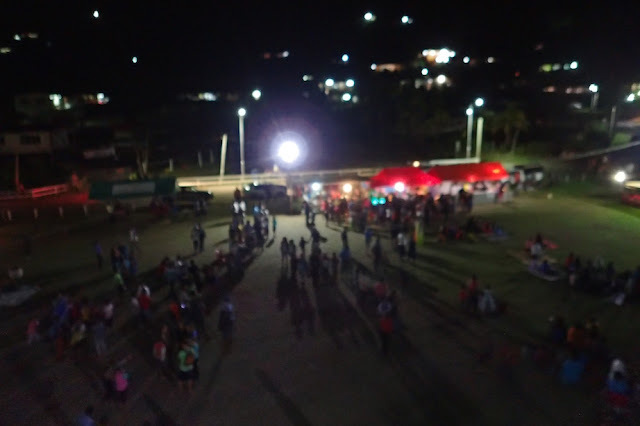 While “Sports Day” meant closed stores, it also heralded the opening of a town carnival. Dead tired after our overnight passage from Makogai, I nonetheless joined our cruising buddies Steve and Patty from Armagh and Lonnie and Bona from another doppelganger boat (Pearson 365) to ours, Good News for the carnival. 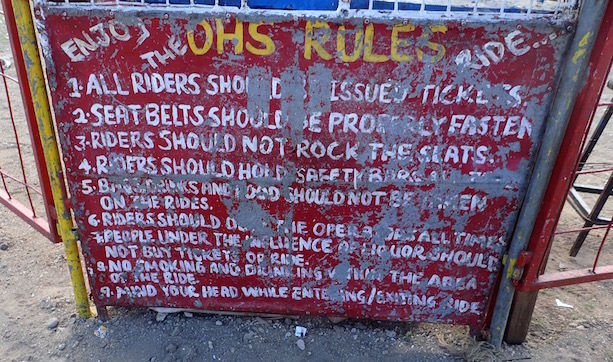 Disconcertingly rustic and primitive controls for Savusavu's visiting ferris wheel. While Wayne wisely caught up on some much-needed sleep, I figured his absence was a good thing; otherwise he’d likely banned me from the ferris wheel. Given my lack of life insurance, one look at its operational mechanics – and Wayne above all is a safety-conscious mechanic – the ferris wheel would’ve been off limits for sure. 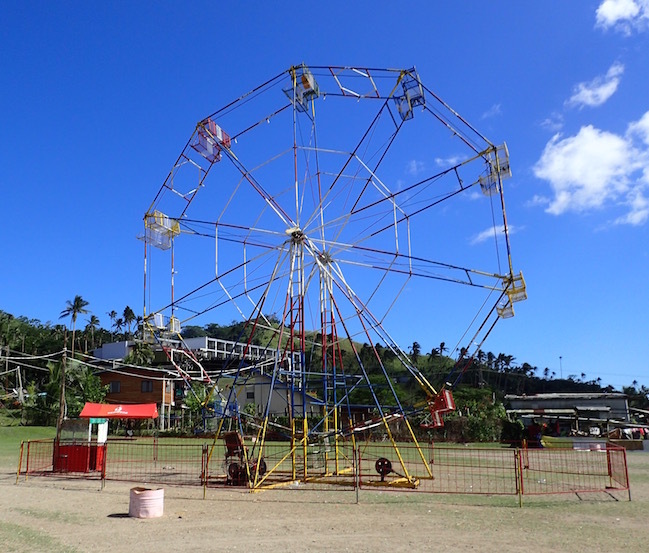 FIJI: Savusavu carnival Ferris wheel rules sign looks far more well traveled than read. clarity. Still this screams of "beer me!" for the Ferris wheel staff. 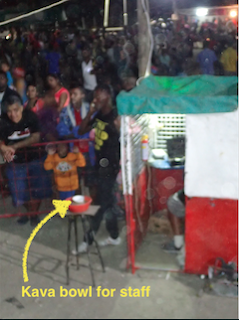 Even without Wayne’s ability to caution us, I’ll admit the kava bowl for the Ferris wheel staff did little in increase our confidence in their enterprise. Amazing how these little details, coupled with enough rickety-ness and much greater than anticipated rotational speed, reminded me of Santa Cruz California’s ancient and deadly* Giant Dipper wooden roller coaster. Who knew a roller coaster could classify as an action adventure? *Seriously – there have been deaths on Santa Cruz’s coaster. 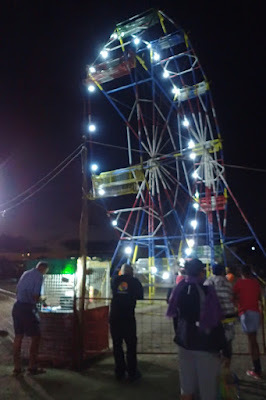 After the Ferris wheel, we considered the little lamb ride, but without checking were sure we exceed its weight ratio as surely as we exceeded the height ratio of the bouncy castle and inflatable slide. Watching the kids on the latter offered excellent entertainment. Savusavu's impressive police band at Sports Day carnival. FIJI. 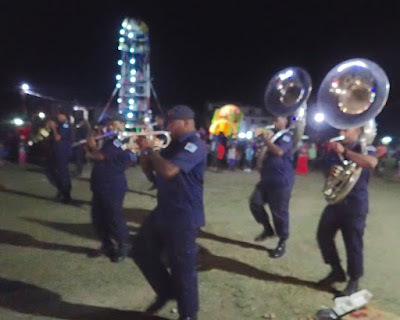 And we were indeed impressed with “the moves” of the local police band, who seemed to take their crowd control capacity as seriously as their music and dancing. We found ourselves shifting position several times as the band literally marched on. 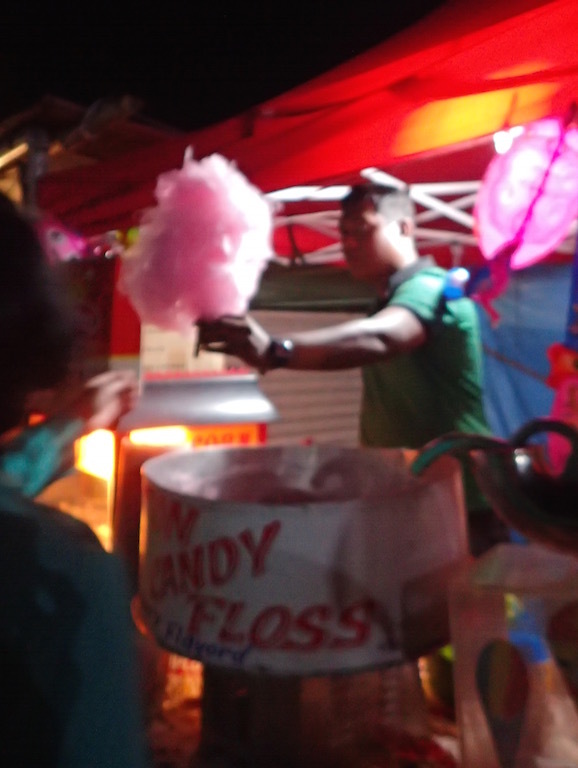 And what carnival would be complete without cotton candy? We approved, though sampled the local Indian confections instead of the fluffy pink stuff. The ferris wheel, I informed him, based, perhaps a tad smugly, on first-hand knowledge. The carnival and its ferris wheel continued on in full swing. 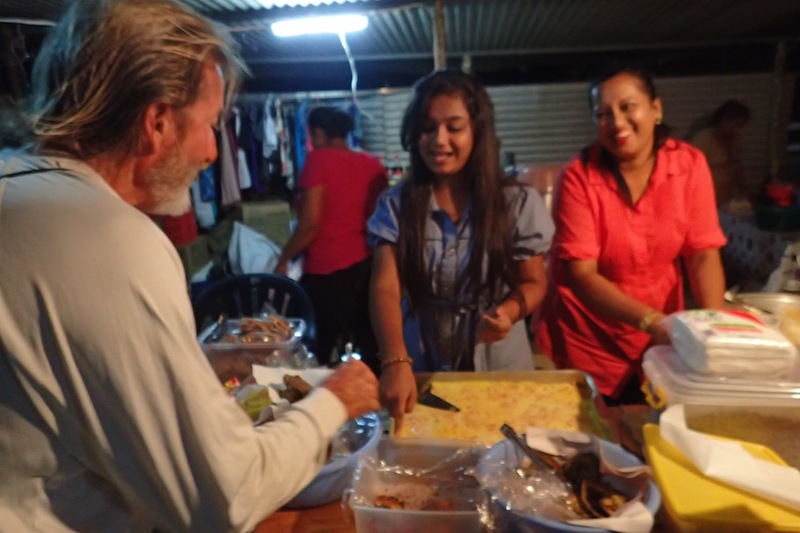 Steve of Armagh pours on his Southern charm for the Savusavu carnival gals, asking advice on how best to indulge his sweet tooth. FIJI. This post is a recent retrospective of our time on Vanua Levu’s Savusavu, where we spent 3 weeks, from June 24th – July 13th. Then, after a foiled attempt to sail to Traveuni, we headed to finish our Fiji travels in the Yasawas. 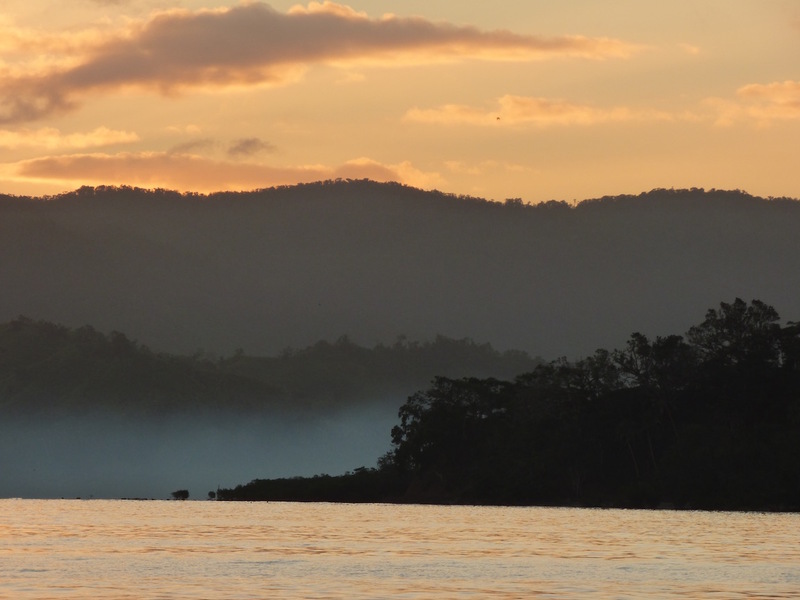 This was pre-posted along the way, from off Nabbuwalu, Vanua Levu (S16.59603 E178.40.965). By the time it posts we'll be making our 74-mile overnight passage to the Yasawas. 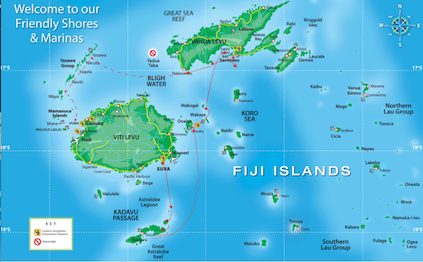 Our FIJI cruising marked in red, with solid done, dotted planned. Not for navigational purposes. This is a "crow flied" map.